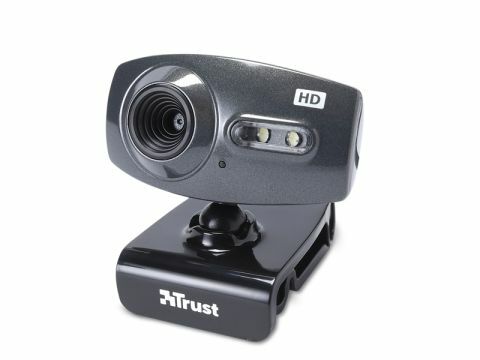 Trust's catchily-titled Widescreen HD Webcam is certainly one the cheapest around. But does it follow that it's also the weakest? Well, to be honest I was expecting that to be the case, but the truth is that this is an incredibly capable little camera. It's about half the size of the FaceVsion camera and is even smaller than the relatively diminutive Logitech C510 too. But it's fairly mighty to boot, with a stable three-way clamp and a pair of white LEDs to the left of the lens to highlight the face in a darkened environment. Neither of the other cameras had anything like that. It doesn't have the more expensive camera's onboard processing power though as it requires a much beefi er system to run on. The minimum CPU specs are down as a modern dual-core, a far cry away from the 1.8GHz CPU the other two needed as a base. Still, if you've got a decent processor you don't need to worry overmuch. That means that it's relying on the CPU when you're recording so we managed a fairly impressive 25fps when it was recording 720p video, though that is when running on a 2.6GHz quad-core. It's also got a quality software bundle too giving you ArcSoft's WebCam Companion in the box. This allows you to do all the silly framing and superimposed face fun, but also allows you to record 720p video and post it directly to YouTube. It also comes with a basic motion recorder too that will record clips and send them to you via email or FTP. A worthwhile webcam then that is surprisingly feature-rich.